Jeju Island is a popular vacation spot in the very south of South Korea. It's also been my home for the last four years. From early spring to late fall the island is full of life, tourists, and always new cafes, restaurants, and events. In winter, Jeju takes a deep breath and slows down. If you're in the mood for a calm vacation, to de-stress and maybe escape the icy -20 Celsius temperatures that reign in Seoul, Jeju Island has a lot to offer even during the colder months. 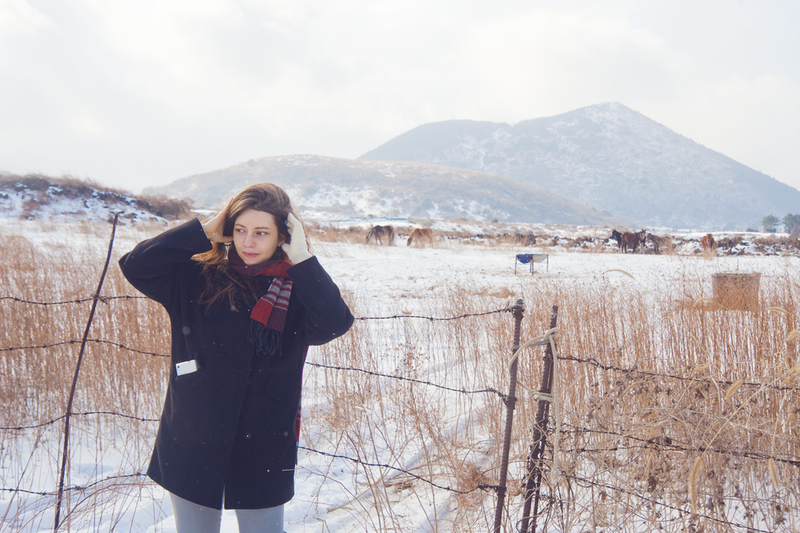 Read on for my travel tips and impressions of Jeju winter life, with a little guide on what to do if you're on Jeju. I love visiting different temples around Jeju Island. Not only is the architecture colorful and gorgeous, but they're often built in the most beautiful spots nature offers. You can find different styles of temples, from the huge Yakcheonsa to the serene Gwaneumsa in the middle of the mountains. Another way to experience Korean traditional architecture is the folk villages and museums. Not only do the folk villages show you the traditional Jeju Island stone houses, but you can experience anything from traditional games to food while you're there. If you're in a folk village or temple during the Seollal Lunar New Year celebrations, you can find traditional festivities. Often, shamanistic rituals and festivals are still held at these well-preserved old sites all over Jeju. A personal favorite: The Stone Museum. Sounds boring, but the volcanic stone formations, their connection to Jeju mythology and folktales, as well as the wide area of the park with its forests, hidden traditional houses and frequent cultural events are gorgeous and perfect to experience when there aren't many other tourists around. The Stone Museum Park is similar to some of the folk villages with its open-air museum, only with a more serene atmosphere and less focused on tourist gimmicks. The available English translations on the park's signage are very detailed and well-made compared to the usual fare, which often only includes a single sentence in English to summarize entire paragraphs of Korean text. If you want to learn about Jeju's mythology and nature/geology while walking through beautiful scenery, this is the place to go! The temples themselves are so much more atmospheric when they aren't crowded, too. 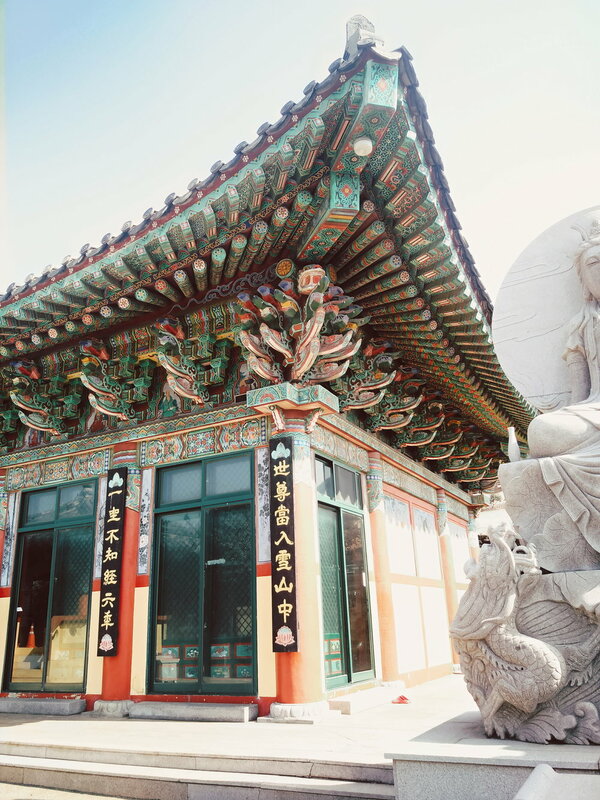 Yakcheonsa Temple has a Temple Stay option! If you need a break from scrambling to find a vegan-friendly option on every menu, a couple of days spent at the temple - all Buddhist temple food is vegan - experiencing traditional temple life and culture might be the perfect breather! Seogwipo in winter, with a (yet!) snow-free Halla Mountain in the background. The south of Jeju Island is always a tad warmer and less windy than the rest and perfect for sunny winter day excursions! Be prepared for the cold! Don't be fooled by Jeju Island being in the south of South Korea! South Korea winters are incredibly chilly and while Jeju doesn't get the worst of it, the strong winds can freeze your face off just fine! Only this year, we had days of sub-zero temperatures and snow followed by warm sunny days without a hitch, so add unpredictability to the mixture. Jeju Island is a popular destination for hiking and winter doesn't have to stop you! Hiking on Jeju Island in winter: If Hallasan is too daunting (or you don't have the equipment needed for that icy route) you can choose between hundreds of "Oreum" - volcanic crater formations - all over the island for short trips. Hiking up Hallasan while it's covered in snow rewards you with beautiful, surreal combinations of white snow, ice, and the deep black color of the volcanic rock beneath. On days with heavy snowfall or strong winds, the popular hiking trail up Hallasan (Halla Mountain) might be closed. Keep an eye open for the weather forecast and invest in winter gear appropriate for icy surfaces. If you don't want to brave the extremes of weather and cold on Halla Mountain, you've got the choice between hundreds of Oreum (volcanic hills) that come in all forms and heights scattered around Jeju Island. My favorite for easy hiking in winter is Yongnunioreum. 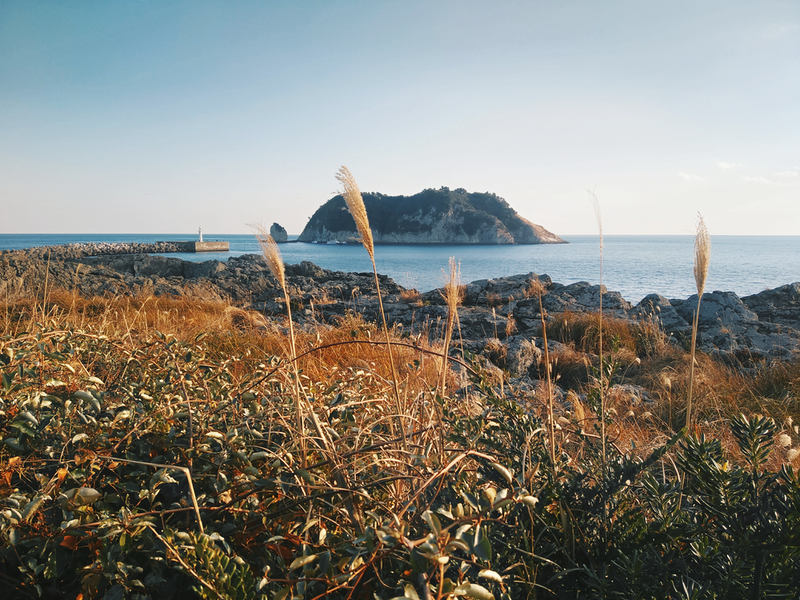 Jeju Island in winter: Travel guide and visual diary by a local. I love the crisp colors and clean air winter brings, and the calm atmosphere all over Jeju. 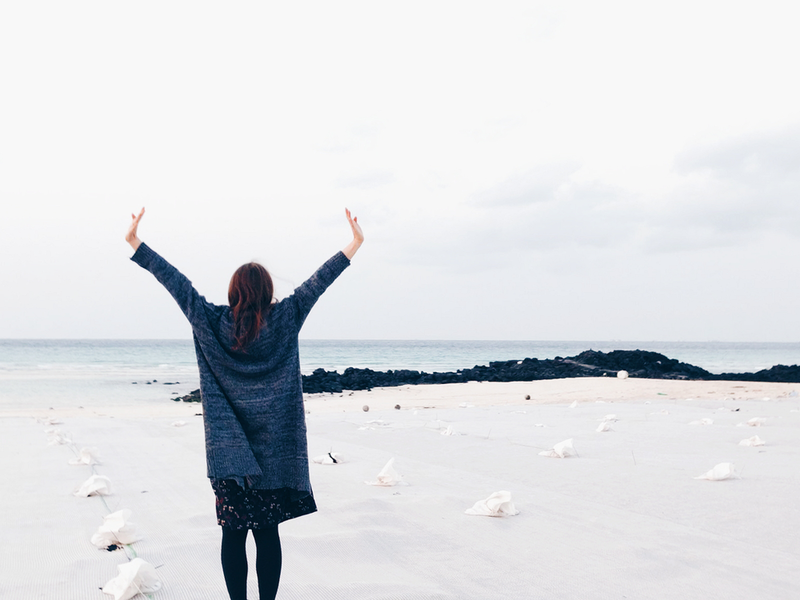 Read on to find tips and inspiration for your own visit to Jeju Island. I'm always surprised at how different Swiss and Korean winters are. Korea, on the other hand, gets incredibly dry in winter. That makes my skin unhappy, but the clear sky and crisp colors you get as a result are worth it! If you've traveled around Korea - or lived here - you surely know about the air pollution problems faced by Seoul. While micro dust pollution has gone up on Jeju, too, it's only a fraction of what you encounter closer to Seoul. Winter has generally the lowest amount of micro-dust, too! The result: Clear winter skies! I mentioned how there are fewer tourists in winter. By a lot. While it depends on your travel preferences, this less busy time is perfect to discover Jeju nature. Instead of always being surrounded by large groups, tour buses, and tour guides, you can find calm and serenity. Jeju Island has a rough charm thanks to its black volcanic stone cliffs and beaches which are just as majestic in winter as in summer. Jeju Island volcanic stone shores: The black rocks of Jeju make for a beautiful contrast against the sea. You can discover lots of smaller islands scattered around the popular vacation destination in South Korea - or read on to find my travel guide to Jeju, with special tips for winter! It doesn't have to be a full-on hike. The Jeju Olle Trails go around the whole island, offering routes near the shore, across hilly landscapes, through small villages, and over wide fields. Read my full (and illustrated) guide to hiking on the Jeju Olle Trail here! Another great destination are the various tiny islands close to Jeju. Some, like Saeseom, can be accessed by bridge directly from Seogwipo near the famous waterfalls, while others like Udo and Marado are accessible by ferry. Since 2017, Udo Island - the largest of the bunch around Jeju - has been made traffic free, with only locals being allowed to bring their car to the island by ferry. I've been to Udo Island both before and after that change and the difference it made to the experience is huge! On the islands themselves, most of the restaurants, guesthouses, and attractions are easily accessible on foot or with local buses. Jeju Island has an abundance of unique, inventive, creative, cute (you name it!) cafes - and each season, new ones open! You can find traditional buildings turned into whimsical dessert cafes, rustique woodsheds (...with the appropriate combinations of alcohol and coffee on its menu), modern & vast coffee shops, small bakeries, greenhouse cafes, and all come with extensive menues that combine coffee and (often traditionally Korean) teas, as well as baked goods. I love going to a new cafe (we've got a dedicated network of locals that share recommendations because otherwise, it would be impossible to keep up with the rapid pace!) and just spending hours trying different kinds of coffee and drawing sketches. You can catch up on your travel diary, get organized - a cafe without free unlimited Wi-fi is pretty much unheard of around here - and just relax. If you need some ideas for starting a travel diary, this tutorial on Skillshare has so many inspiring tips! You can get access to the full library (over 18000 classes!) available to premium users of Skillshare for free if you sign up for a trial month via my referral link. No matter if you want to get into travel photography or urban sketching, there's a course in the library for everything and every skill level. is such a nice memory to look back on later! Despite having lived on Jeju for over four years now, I still love to look at every place I go through the lens of a traveler. A recent favorite is Cafe "Rubato" in Jeju City. The industrial design is combined with just enough whimsical decor to make it cozy, there's a selection of books and magazines to read, and a collection of vintage cameras, coffee grinders, and other trinkets that are prime sketching material. 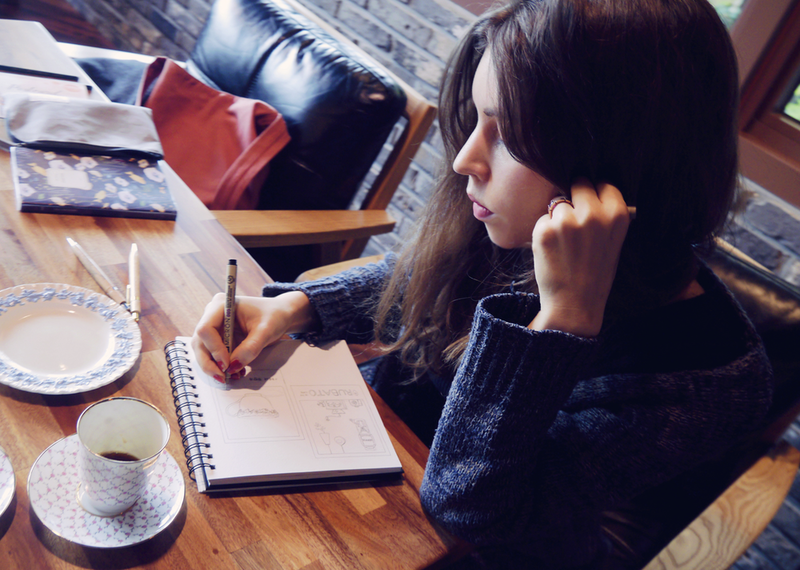 You'll find that Korean cafes often offer a wide selection of different coffee styles. Choose between different roasts, blends, and anything from the ever-present Americano to hand-drip coffee. Another favorite is the now famous "Yudong Coffee". The barista who owns this tiny coffee shop in Seogwipo right at the bottom of Art Street has won pretty much every coffee-related award under the sun and you can taste it! The three main blends of coffee offered are distinct and especially the faintly orange scented one (Blend B) is so unique and delicious. Bonus point: It's rare for smaller cafes - or even large coffee shops - in Korea to offer soy milk options, but Yudong Coffee makes some delicious soy lattes! They also just launched a Coconut Cream Ice Coffee. Maybe not the most wintery beverage, but delicious and a very unique find here on Jeju! It feels like more and more cafes offer vegan-friendly alternatives, though, and I'm optimistic about the future! 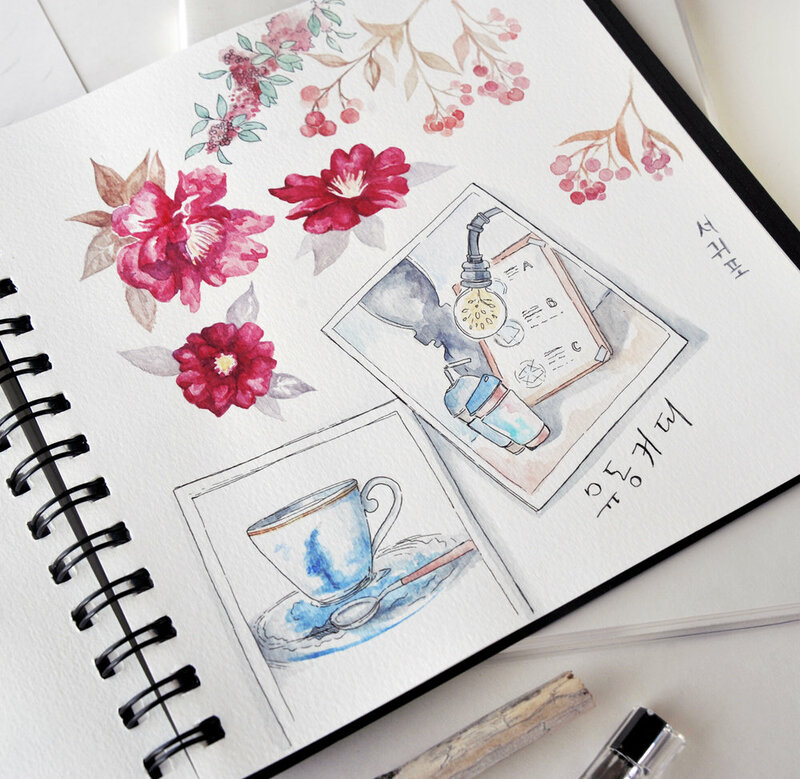 As you can see on my travel sketch from our last visit to Seogwipo, the camellia flowers were in full bloom in January! Winters are gray and cold, aren't they? But if you're on Jeju Island during January, you can find these gorgeous specs of color all over the island. 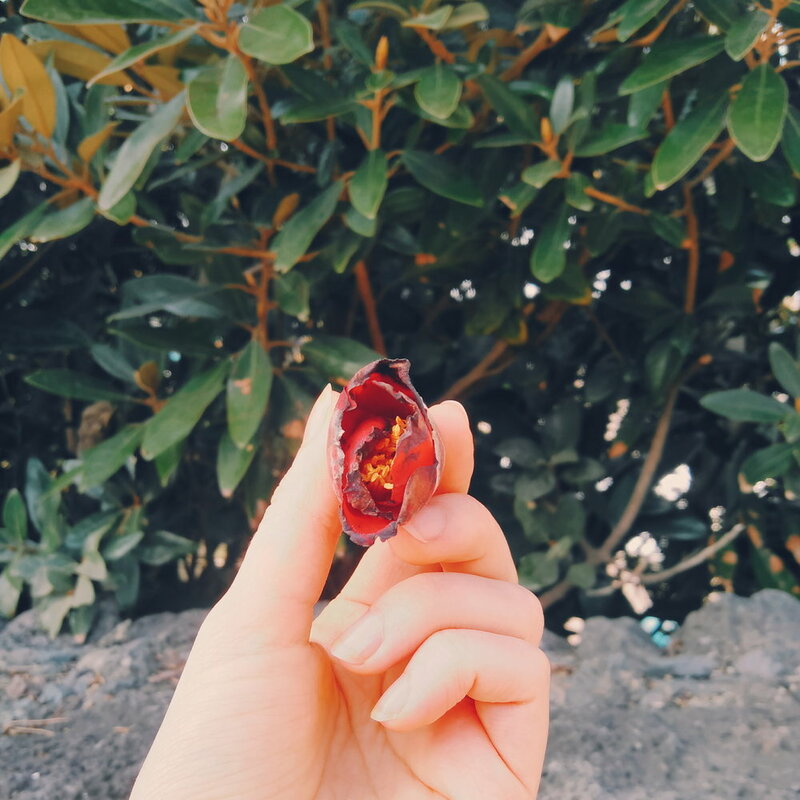 There are two distinct kinds of Camellia: The traditional Korean "Dongbaek" Camellia one with its very few, stiff petals and a deep red color, and the more full-blossomed Asian Camellia that took over in recent times with flowers in a bright pink. The typical Korean Camellia flower "Dongbaek" - in full bloom from January to February on Jeju Island. Camellia Hill makes for the prettiest background, even though it's a bit crowded during the Camellia season (January till March). Every single Korean tourist seems to want at least one picture with these gorgeous flowers! Some international travel reviews noted that they wish they'd come in summer to see the Camellia (instead of coming in fall or spring) but that's a misunderstanding, I think, since the peak season is winter/very early spring. In summer, the Camellia Hill garden has other flowers like Hydrangea in full bloom, so it's always worth a visit. Winter is Mandarin Season on Jeju Island! If you haven't tasted the local mandarins, you're missing out! From tiny, sweet Gamgyul to the huge Hallabong, there are so many unique variations of mandarins/clementines/oranges that you can only find on Jeju Island. From November till March you'll be able to find them all over the island on traditional markets - but you can also go pick your own at some of the farms in the south of the island. Get yourself a whole box and eat away! Last Winter Perk: Everything is Cheaper! From flights to admission fees to hotels, Jeju Island scales back its prices during Winter. You can check out the gorgeous rental homes and guest houses that combine traditional Jeju architecture with modern elements or get hotel rooms for a reduced fee. One of my favorite guest houses on the east coast: Gongsaba - they have Ghibli themed rooms combined with minimalist decor! I'm so grateful to live on this gorgeous island, and while I can't travel around a lot, whenever I do, my sketchbook and camera are with me. Hopefully, this very photography-heavy travel diary gave you inspiration for your trip to Jeju Island - even and especially during winter! ...and check out my other travel guides.